The following 4 trail heads comprise a brief listing only of all the places the Avon Trail is accessed along its 113 km length from St. Marys to Conestogo. 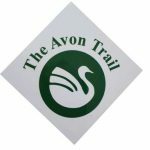 Try out the trail; if you like what you find, consider purchasing edition 7.5 of the Avon Trail Guide containing detailed information about all trailhead locations. The Trail Guide is available online or at the Stratford Tourism office, Fanfare Books, St. Marys Tourism or other locations listed on our website. Your purchase supports ongoing trail maintenance by dedicated volunteers. Many trailheads are marked with a small 4” x 4” diamond sign at the road side. Once at a trailhead, look for and follow the 2” x 6” white blazes (main Trail) painted on trees or poles, or blue blazes for the Stratford Side Trail. Wildwood CA – on Oxford Line 31, about 5km south from Hwy 7, Look for the trail heading west, just before crossing the bridge. This is a trailhead for the Wildwood Lake Trail (Blue markers) which the Avon Trail follows heading west for the next 10 km. Bimini Loop on Embro Rd. (43.296487,-80.973431) Trail head is about 200 m south of Embro Rd. & Perth Line 20. Trailheads go both east and west of each other, the east trailhead being less than 100 m south of the west bound trail. The west bound trail is a loop. Forest Rd. trailhead (43.365889,-80.928523) Head south toward Line 29. At the south end, the trail follows a private driveway to Line 29, crosses the road and continues in a southerly direction.